"We The People" have won the war! We The People have won the war! Rumor has it that the Cabal is checkmated. Martial law stage three has been in place since 3 am last Sunday, and the arrests are coming soon. 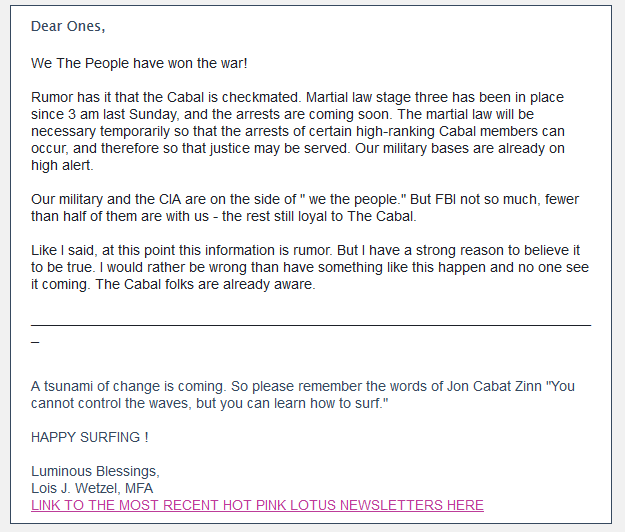 The martial law will be necessary temporarily so that the arrests of certain high-ranking Cabal members can occur, and therefore so that justice may be served. Our military bases are already on high alert. Our military and the CIA are on the side of " we the people." But FBI not so much, fewer than half of them are with us - the rest still loyal to The Cabal. Like I said, at this point this information is rumor. But I have a strong reason to believe it to be true. I would rather be wrong than have something like this happen and no one see it coming. The Cabal folks are already aware.